The quality of the samples is first rate. The cleverness of the idea is first rate. The UI is so easy to navigate (love the changing logo when you use the mod wheel). And I'd have emailed sooner, but I just finally pulled myself away from the keyboard. It's addictive. Really - an outstanding library. Kudos to all who were involved in creating it! For me HAG is a very tingling, bright and airy percussive guitar lib which adds freshness to my compositions. It is highly inspirational. It's that spark that ignites creativity. ...The attention to detail in sound really shows how well this library was put together. 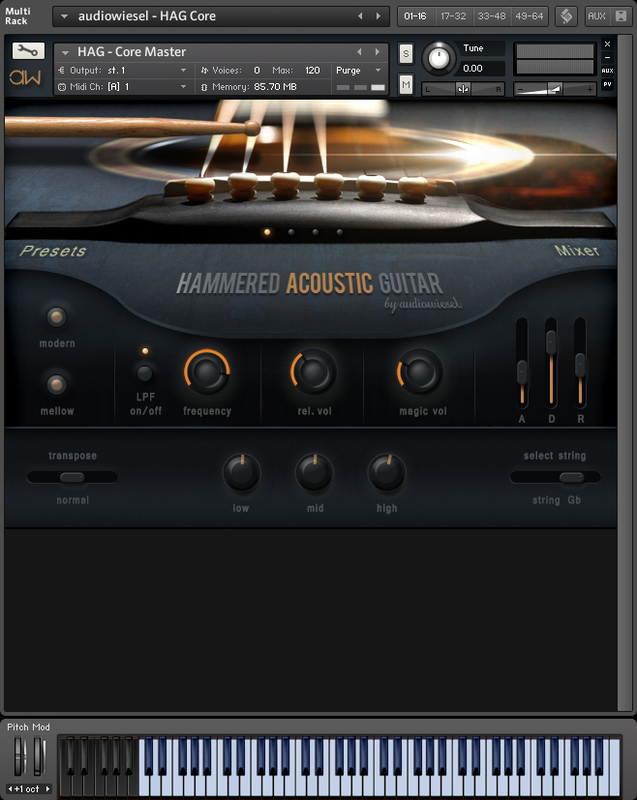 summary: Hammered acoustic guitar is a unique library and will bring you many hours of fun while playing with it. Its strong sound quality will bring a whole new vibe to your tracks. HAG brings me the chance to add roughness and that unique organic feeling that sometimes is not possible to achieve with other libraries. It sounds like a legendary instrument from another world, and works flawlessly in many contexts, from ethnic music to hybrid neo-orchestral. Awesome stuff. 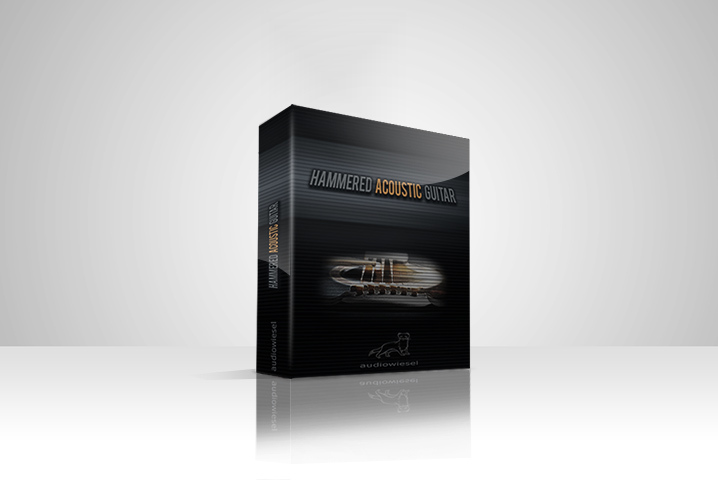 I have been using the Hammered Acoustic Guitar FX library lately - what a fantastic library it is! The library has great sonic diversity and is extremely versatile - it excels in both intimate and epic scores. It really can yield amazing results easily. All the recordings are recorded super well, and the mangled up sound are unique and well produced. 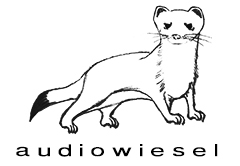 You will get sounds in this library that you simply can't find anywhere else. To me, the best part about HAG is its versatility. You wouldn't think it based solely on the name, but it's a fantastic percussion library with some really great sounds. Then you load another patch and you have this incredibly unique melodic instrument. As a composer, the ability to have these unique sounds that so few people have heard before is worth the library's weight in gold. There's a ton of mileage to be had in HAG and at this point I feel like I've only scratched the surface. When I'm writing and searching for inspiration, I love the organic, living breathing qualities in sound design. Something that ensures a connection to something very real is happening even with a sample. I think HAG captures that organic magic so well. It adds some grit, flavour and realism that is so often missing from sampled matter. HAG makes that essential leap from just sound design, to actual 'new instrument' territory. For my music I’m interested in unusual organic textures and HAG delivers that in numerous ways. These are great sounds that are both familiar AND unfamiliar at the same time, and I love that. As a sound designer myself, I can feel the attention to detail in every note. It’s a great library; flexible and unique. Hammered Acoustic Guitar (HAG) is the result of „playing“ an Ibanez AE acoustic guitar with drum sticks and brushes. In order to make it punchy and powerful we used two steel strings and tuned them to same pitch. This way we could maintain a slight modulation of the sound, a beat frequency. But we did not stop after recording single notes. In fact, we have expanded the concept and did additional recording sessions dedicated to percussion and effect sounds. Especially the FX content is heavily processed and offers great material for musical sound design. Check out the special features of each package in the tab menu below. Also, you shouldn’t miss to take a closer look at the patch list. 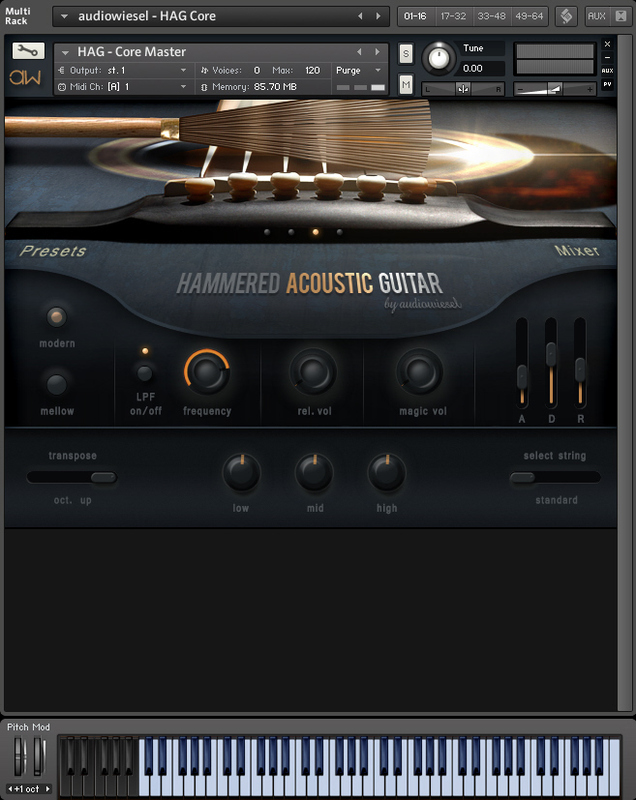 Important note: In order to use HAG you have to have the full version of Native Instruments‘ Kontakt 5.1 (or higher). This library does not work with the free Kontakt Player. This package consists of the master patch. It is great for harmonic rhythms, accents or melodic lines. In this package you find all percussive sounds and the FX section. This is great for spicing up your tracks. Simply said, you get everything what is included in ‚Core‘ and ‚FX & Percussion‘ and even more. We have created some special patches which make use of both sample contents. Get the FREE v1.5 Bonus Patch here. Get the FREE Sci-Fi Sounds by Zdravko Djordjevic here. Using key switches makes it easy to select the perfect sound for your track. Great control for musical sound design. By hitting on midi gate you are able to create rhythmical pulses or stutter effects. Also make use of the density slider to alter the effect. On top of the playable range of each instrument you find key switches which let you turn on/off single effects like distortion, chorus or flanger. This special patch is designed to create sonic backgrounds. In addition to midi gate you can trigger patterns which run in sync to your host tempo. Don’t want the instrument to play in perfect pitch? Use the detune slider and play some creepy out-of-tune phrases for instant horror feeling. By using the modwheel you add space to each sound. Use this function to blur the sound and to push it into the background. This patch gives you access to all percussion instruments in one go. If you are looking for more control over each sound, go for single patches. Each clean percussion sound has its own bad twin. By moving this slider you adjust the ratio between good and evil (or clean and distorted). Each percussion instrument has its own depth and space layer. This is also true for their bad twins. Move the modwheel to make use of this function. 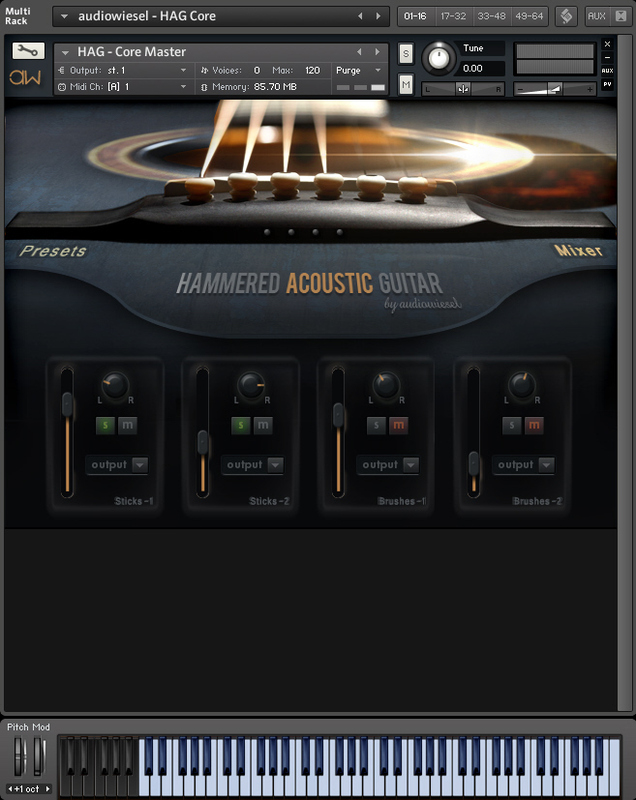 You can play up to 4 guitars at the same time (2x Sticks, 2x Brushes). Modify each guitar separately to shape your sound. Each guitar runs through its own channel strip. Create wide stereo images or automate the controls along your track. Jump through 8 different presets (4 single layer, 4 ensemble presets) or create your own by using the user preset slots. Determine what strings of the guitar shall be used for playback. This can also be randomized! This additional sound layer enhances overtones and presence. Use magic carefully and don’t overdo it as it alters the original sound. If you are looking for an intimate sound with a smaller dynamic range, these patches are for you. They are very suitable for piano-esque playing. This bonus patch provides an aggressive and distorted sound. Additionally, a set of string hits is included as well. When this button is turned on, all samples are tuned perfectly and the overall sound is a little bit brighter. When turned off the sound appears a little bit sloppy with more character. The difference between both is subtle, but it’s there.